The Story of Science Classroom Companion is a boon for teachers who choose master storyteller Joy Hakim’s Einstein Adds a New Dimension as a primary or supplemental physics text. 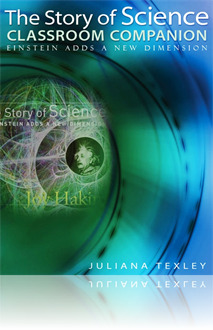 Hakim’s newest title in The Story of Science series brings to life the history of Albert Einstein and his fellow scientists as they lay the groundwork for concepts of particle physics and quantum mechanics. The Classroom Companion, which includes editions for both teachers and students, follows Hakim’s text chapter by chapter and provides teaching tips, lists of key vocabulary words, activities, writing prompts, additional online and print resources, and more. Free to NSTA members, this easily downloaded e-book will help classroom teachers and parents of homeschoolers use Hakim’s outstanding Einstein Adds a New Dimension to integrate science process with science literacy.